Hi, my name is Cara and I’m a chakraholic. Ever since the first time I cried in camel’s pose, I’ve been intrigued by the notion that certain parts of our body are connected to different emotions, traits and human needs. You totally speak my language. I think you’re my soul sister! Those who look at me like I’m off my rocker. Oh friend, you are a crazy hippie. So this post is for both camps. For those of you who love chakras and those who look at me like I’ve been drinking too much kombucha. Because all of you say things that prove the theory of the chakra system, whether or not you know it. This chakra is located at the base of the spine and is associated with being grounded, security and basic needs (shelter, food, money, etc.). I put my roots down in Kansas City. You’re calling Kansas City your home — the place you feel safe and secure. Implies you need some help with basic needs. Stop thinking about fairies and come down to where reality lives (the root chakra!). This chakra is located in the sacrum region and is associated with creativity and emotional stability. Blake got butthurt when Lindsay took his cookie. Blake had a strong emotional reaction (in the sacral area). Reference to water and implies you may need to chill out and be a little more emotionally stable. This chakra is located in the belly and is associated with instinct, power and self-esteem. I have a gut feeling. Your instincts are having a physical reaction. If you refrain from acting on it, you are restraining your power. My self-esteem is high and I’m feeling powerful. This chakra is located in your chest/heart area and is associated with love and compassion. Does this need explanation? Yes, love (the heart chakra) is associated with air. She has a heart of gold. / She has a heart of stone. She’s a very compassionate person. / She’s not a compassionate person. My love for him was not reciprocated, and my heart chakra is not in good shape. This chakra is located in your throat and is associated with communication, speech, hearing and self-expression. Please stop stuffing your beliefs down my throat. I don’t appreciate you forcing me to hear and learn your beliefs without allowing me to express myself. I stuck my neck out and said what everyone else was thinking. They’re always at each other’s throats. They argue — communicate — aggressively with each other. This chakra is located between your eyes and is associated with perception, wisdom and intuition. OK. This one’s not a phrase. But Harry Potter’s infamous lightening-shaped scar is located on his third eye chakra. This scar connected him to He-Who-Must-Not-be-Named and gave him wisdom (for better or worse). News of their breakup hit me right between the eyes. I became suddenly aware of their breakup. 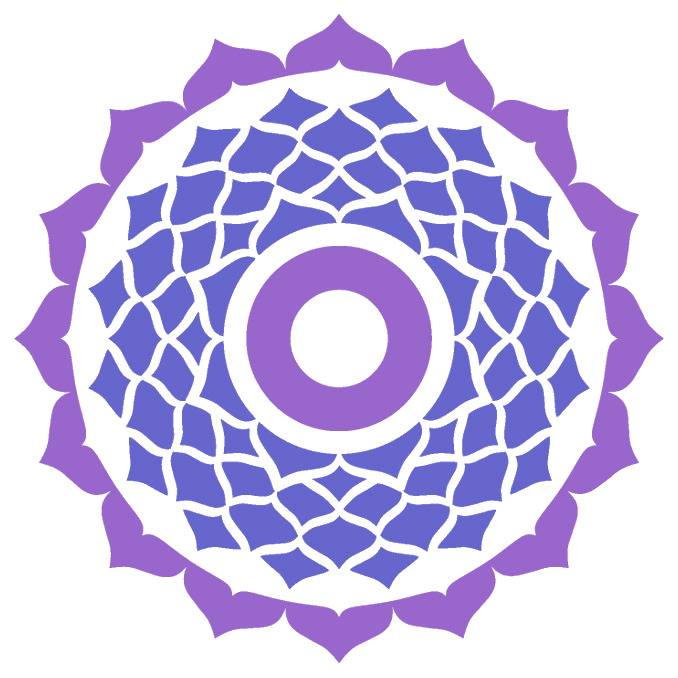 This chakra is located at the crown of the head and is associated with detachment from the ego and enlightenment. He’s really attached to his ego. I have a huge deadline hanging over my head. You cannot achieve true happiness/enlightenment because you’re too attached to something outside yourself. Camp two people — I know what you're thinking. That obviously wisdom is associated with our heads; it's where our brains are. But what about your heart? Why do we draw little hearts when we're in love? And how about gut feelings? Why does that make sense? So the next time you hear one of these phrases, I hope you think about the chakras. Even if you do think I'm a crazy hippie. Want more chakra love? Come play yoga with me!